ST. GEORGE — Twenty of Washington County’s most talented solo and group acts took the stage Thursday night at the M.K. Cox Performing Arts Center on the Dixie State University campus in hopes of winning the “Dixie’s Got Talent 2018 Finale,” hosted by the Dixie State University Alumni Association. The tight competition featured an array of talents from vocal and dance acts to poetry and piano, performed before an esteemed panel of judges and an almost sold-out crowd. Cash prizes were awarded to one runner-up and one winner in both the youth (17 and under) and adult (18 and up) categories. Vocalists Kierstyn Meredith (youth) and Josian Brett (adult) took home the runner-up awards and $250 each for their powerhouse vocals. “I feel awesome,” Brett said of her performance. Brett is a member of Dixie State University singing group Raging Red and looks forward to touring in Japan with the group later this year and pursuing a career in music, she said, hopefully on Broadway. Meredith, who was the first contestant up, said she was excited about making it to the finals, adding that she had worked really hard on her song with her vocal coach. “I’m super happy with how it turned out,” Meredith said. The mother and son duo were thrilled with their victories, especially since they were able to do it together. Normally a vocal performer, McKenzie Turley said that playing the piano on stage was something new to her that was a bit outside her comfort zone. Winners were chosen by a combination of judges scores, which accounted for 50 percent of their total, and by audience voting, which made up the other 50 percent of their score. Judges for the Dixie’s Got Talent 2018 Finale included international performer and YouTube sensation Alex Boyé, Grammy-nominated artist Merrill Osmond, St. George Health & Wellness magazine editor Kristi Osmond, former Miss Utah Krissia Hall, emergency medicine specialist Dr. Nate Holman, Broadway-touring performer Rachel Holman and director of the DSU Campus Store Aaron Meadows. It was a tough night for the judges who were presented with a packed field of talent. Hall said they were really happy with who won and extended congratulations to all of the finalists whom, she said, all deserved to be there. The Dixie’s Got Talent competition was started by the Dixie Scholarship Associates as a way to encourage the performing arts and raise funds to support scholarships that help students in need. “All of the money we raise, every penny we make and raise goes to needs-based scholarships,” said DSU Dean of Students Del Beatty. The scholarships provide an opportunity to go to school to people who have faced significant challenges, Beatty said, circumstances such as the death of a loved one, health challenges, divorce or career setbacks. Beatty has produced all of the Dixie’s Got Talent final shows throughout the years. He is so grateful for the community support of the event, he said, and the talent that exists in Washington County. 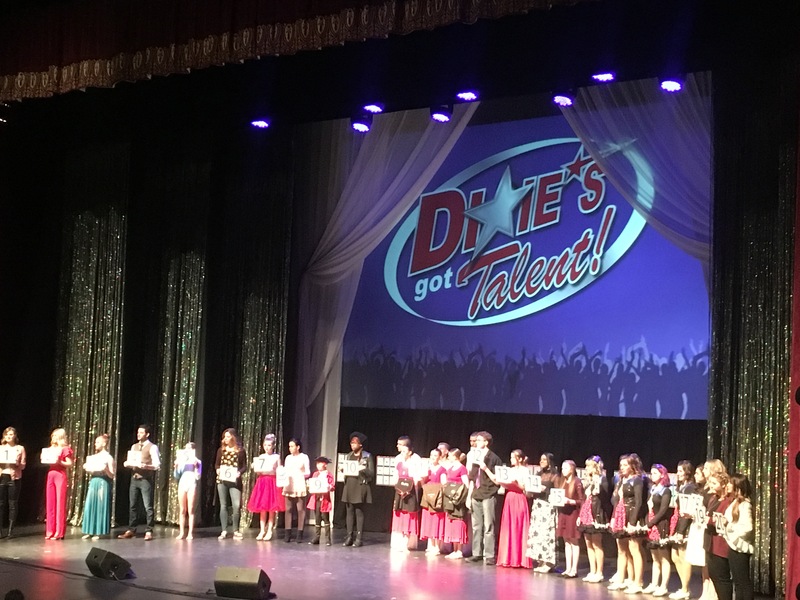 Dixie’s Got Talent is produced with the cooperation of the Dixie State University Student Alumni Association, Dixie Foundation and Dixie State University. Dr. Jordon Sharp, DSU’s chief marketing and communications officer and the adult winner (along with his wife) of the Dixie’s Got Talent 2016 Finale, was the emcee for the evening.